I'm declaring this glitter week on my blog! 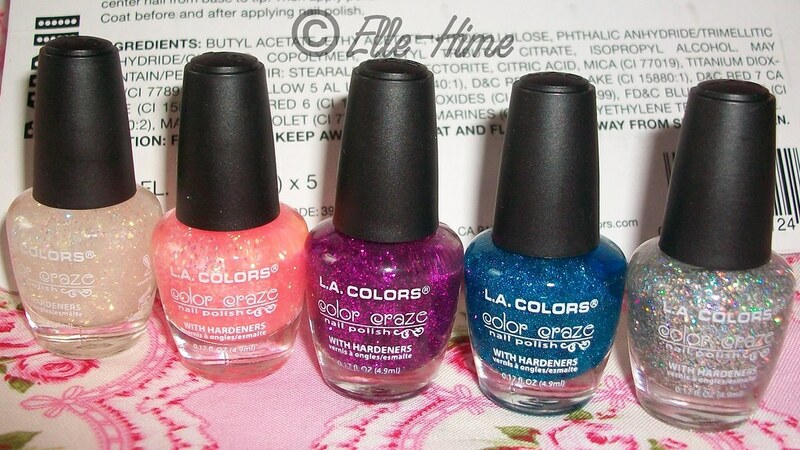 To kick things off I have swatches from a set of LA Colors minis. These sets are only numbered and the polishes are not marked. I did some searching to try to determine if they correspond to any of the brand's regular-sized bottle colors. Find out more after the jump! Packaging gripes aside these are awesome little polishes because they are Cruelty Free - a little heart-ear bun assures you of this on each mini bottle. LA Colors also gets props from me for printing out the ingredients on each little bottle. They advertise being Big 3 Free, however I could not find Camphor listed in their ingredients either, so I believe this qualifies them as Big 4 Free! It's nice to find an affordable polish that quickly sets your mind at ease about these things. a Clear with Opalescent glitter - This looks like Sassy Sparkle rebottled! 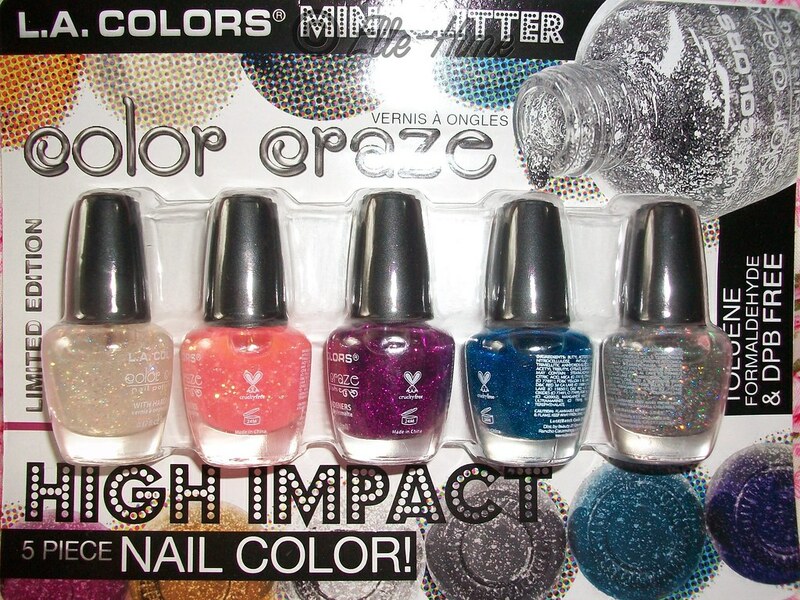 Small-sized glitter, reflects a rainbow of colors over a light or dark base. Glitter spreads well over the nail, has a nice density. a Peach with Opalescent glitter - small and tiny glitters, reflects purple and green on light base, blue and green on dark base. Glitters spread well and have a nice density. Peach-toned base does not show up, just looks clear when applied. a Clear with Purple glitter - I believe this is their Glistening Purple color rebottled! Tiny purple glitter that spreads well. 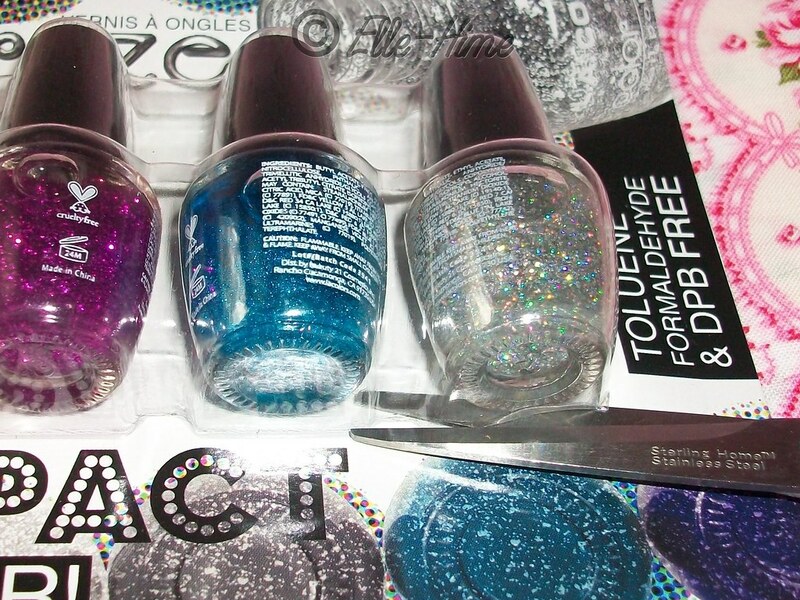 a Blue with Blues + Black glitter - I believe this is Aqua Crystals rebottled! Microfine glitter, you mainly see the two blue colors, but there are a few black bits sprinkled in! All the colors show on a light base, silver and blue show up on a dark base. The base is tinted and doesn't have streaking issues. a Clear with Prismatic Silver glitter - I think it's rebottled Star Light! Small silver glitter that reflect a holo-type rainbow of colors. Density of the glitter is spot-on and there are no application issues. My nail wheel swatches are just one coat of each polish, swatched from left to right in the order they are packaged. In all I really like these glitters. The first two opalescent (or iridescent) colors are probably too similar to justify being in the same set, but they do have their subtle differences and with only being mini bottles I don't feel bad for having both to use. The peach-jelly color is the only one I could not figure out a name for, the others I will call by their matched color names from now on. I matched them by searching for swatches and descriptions Online; so far as I call tell they are identical. I hope this helps people trying to find swatches of these sets! I had to buy these blindly myself. The 124 Glitter set has nice colors and I think it's a perfect way to sample different glitters. These are colors that I would probably admire in the bottle but put back on the shelf in a store, but I like having a small portion to play with when I do feel like blinging out my nails! I'll be showing set 126 next!